Month: November 2017 - ThirtySevenWest ThirtySevenWest - Creative ideas about personalized custom ribbons, woven tags and labels, personalized gifts and more!!! The rule of 7 is a idea which is rooted in smart and compelling marketing techniques that are strategically designed to a elicit a favorable consumer response. You can debate whether or not walking under a ladder brings you bad luck, or if a black cat crossing your path is a horrible omen. But when it comes to the concept of Add Media “Lucky Number 7”, brand managers may have a superstition worth investing in! That’s right, skeptics, science has spoken! According to data collected by Yankelovich Consumer Research, the number of times it takes for a brand to reach out to consumers until they seriously consider buying is none other than “saintly seven”. Commonly referred to as “The Marketing Rule of 7”, the idea is not entirely new to most businesses who apply it extensively throughout their advertising campaigns. In particular, it comes from the psychological concept of “mere exposure effect” which proves a strong correlation between familiarity with a product and preferential consumption. Now, let’s be clear: nobody likes a pushy salesperson, especially when you’re not particularly looking for the product they’re selling. 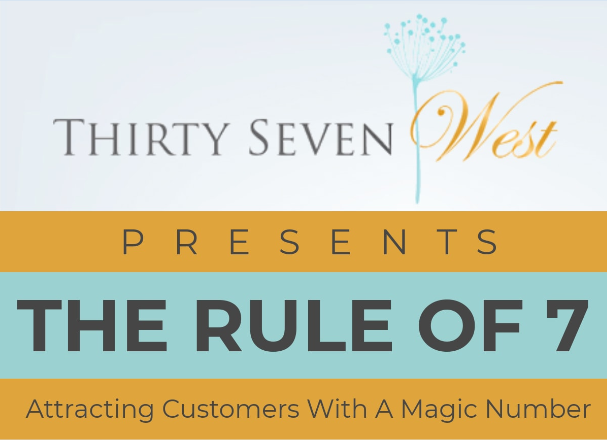 The idea of reaching out to customers 7 times isn’t rooted in relentless persuasion. It’s rooted in smart and compelling marketing techniques that are strategically designed to elicit a favorable consumer response. So, if you think your big-budget commercial is enough to maintain sales for an entire year, you’re sadly mistaken. You definitely don’t want to be the face of an ad that’s so overplayed that it triggers collective groans. Master the Marketing Rule of Seven by reiterating your message with the help of NEW strategies. According to marketing research, 80% sales are made between the 5th and 12th contact between brand and consumer. That’s 5 to 12 opportunities to make a fantastic 1st impression. Seven isn’t just the number of times you should promote your product; it’s the minimum number of times you should make an effort to connect and engage with a niche audience. From trade shows and corporate events to seasonal promotions and sales, consider every event, venue and time an opportunity to personalize your product and deliver your message. Custom logo ribbons are a fabulous, cost-effective way to do this as they bank on a particular theme for marketing and brand management and visibility while impressing your target market. The best part about this genius marketing strategy? There’s a ribbon for every occasion! This means your product gets maximum exposure every single time with the help of a luxury ribbon that speaks louder than words! Although a seemingly small addition, custom ribbons are selected and designed with acute marketing knowledge, keeping in mind your brand personality and the specifics of your target audience, including age, gender and profession. From Louis Vuitton and Amazon on jetBlue, to Bank of America and Salesforce, aerie, Revlon, American Heart Association, and Wyndham, some of the biggest businesses are banking on this trend, so why aren’t you? Make sure your customers stop and listen with the help of a meaningful gesture that’s sure to boost sales! 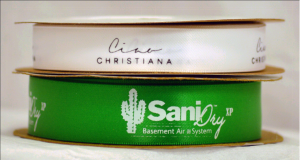 Call us now at 1-877-627-9408 and choose a ribbon that’s right for you!